When Jesus arrived at Bethany, he was told that Lazarus had already been in his grave for four days. Bethany was only a few miles down the road from Jerusalem, and many of the people had come to console Martha and Mary in their loss. 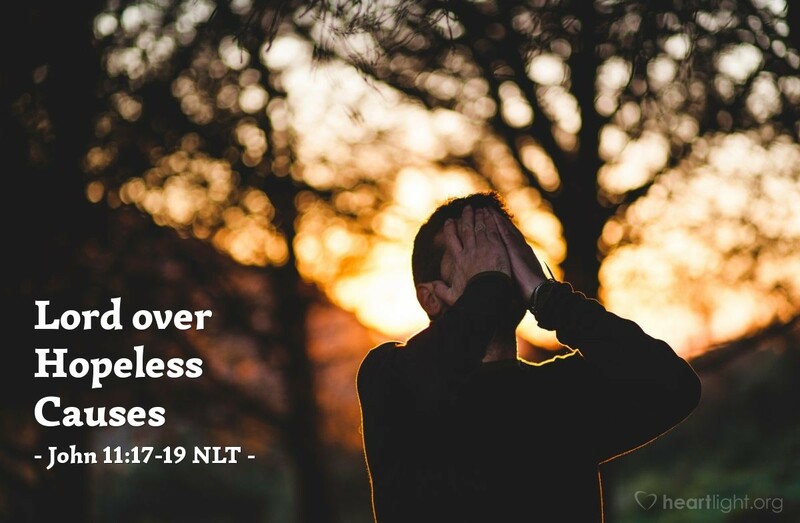 Did you ever notice that Jesus is the Lord over hopeless causes? Can you think of a funeral he attended that he didn't "ruin" by raising the dead person to life? Remember the time he provided a picnic for more than 5,000 from one boy's "sardine sandwiches"? Do you recall how he almost sank the futile fisherman's boat with an overwhelming catch of fish? Wasn't it amazing when he saved the terrified disciples by calming the seas they feared would sink their boat and them? So in what area of your life do you find yourself hopeless? Have you ever just admitted that you are powerless to face whatever it is and invited him in? It might be a bumpy ride, but he is still the Lord over hopeless causes! Cry out and ask for his help. Admit your need for his help right now, and then share that admission and ask for prayer and accountability from another brother or sister in Christ. I believe you will discover that he can put the hope back in your cause! Give me hope, O Lord, for I rely on you and trust in your gracious power to carry me through. I cannot win the battle I now face without your power, presence, and mercy. Please be near with your power. In Jesus' mighty name, I pray. Amen.